A view of Tokyo, one of Asia's best-prepared cities. South and Southeast Asian cities have a combined population of more than 2.5 billion, eclipsing that of China. India will see its urban population soar to 416 million people by 2050 (compared to 255 million new city dwellers in China). The fastest urban population expansion is set to occur in secondary cities of Indonesia, the Philippines, Thailand and Vietnam. These two regions with their young populations will unleash Asia’s next growth wave. But while their infrastructure is adequate, and there is boundless investment on the way, the social and environmental risks are mounting. India’s tech hubs of Bangalore and Hyderabad have grown so quickly that they too have sacrificed natural habitats and vegetation for poorly planned built-up areas. Without massive investments in basic water supply and sanitation, public transportation and distributed housing, these new engines of India’s tech sector will sputter. Southeast Asian cities are rapidly growing without commensurate investment in strengthening their adaptive capacity. The approach taken in Manila has been to push for rapid conversion of former defense and industrial facilities such as “New Clark City,” employing sustainable building codes and an Internet of Things (IoT) focus in the process. Bangkok’s excessive groundwater pumping has accelerated the city’s subsidence rate to up to 3cm per year, with the threat to the city’s foundations amplified by rising sea levels (which also pose a grave threat to Jakarta) and volatile flooding. While Jakarta is investing in sea barriers to slow the rising tide, Bangkok is working to retrofit its dilapidated water infrastructure to promote efficiency and conservation. Even a cursory review of Asia’s largest megacities reveals a number of hard truths and constructive recommendations. First, Asia’s inhabitants are not turning away from urbanization despite myriad existential risks. This means federal, state and municipal authorities need to plan for long-term demographic realities – empowering cities with the necessary autonomy and discretion to plan for the future. Second, Asia’s cities need to place ecological priorities front and center in order to protect their vulnerable populations and build resilience against environmental volatility. This will require significantly greater commitments of public and private resources towards new project pipelines and stricter regulations to ensure sustainable infrastructure development. 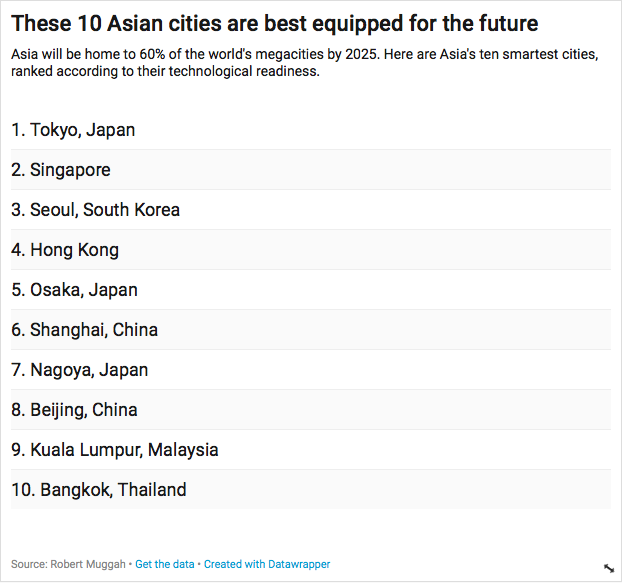 Third, Asian cities need to adopt smarter technologies as they move forward. The use of green building materials, the deployment of 3D printed construction methods, the installation of environmental sensor networks, and investments in integrated public transport and renewable energy are all available at ever lower cost. The good news? Sustainable urban innovation is achievable even for humanity’s largest urban clusters.